The Institute of Natural Ressource Sciences (IUNR) focuses on the sustainable use of natural ressources and the responsibility towards human and natural environment. Through exhibitions, collections and courses, the Naturama museum promotes better knowledge of the species, biodiversity as well as nature conservation and sustainability. Photo-identification keys for the determination of higher plants in Germany, including common garden plants. 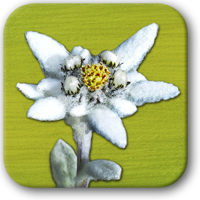 A great app to identify the most common alpin flowers in Switzerland.